Que Sera, Sera What will be, will be.!!! How true can that be! Future is not ours to see. How easy life seems when you are still a nipper. Everything seems within your grasp – be it sun, star, be it a profession that is dreamt of, be it becoming famous and rich! How innocent can childhood be. No wonder that we yearn for it once we grow up to realize the harsh realities of life. That nothing in the world comes for free. That life is full of ups and downs! Abha tagged me to list down 7 of my childhood memories. Thanks Abha, I so needed something to wake up my sleeping blog ;) Frankly, my list would not be much different from yours, but nevertheless here I go. My earliest of memories takes me to cycle rickshaws. I grew up in a town very close to Delhi. Those were the days when cars were still considered a luxury and the town being small, cycle rickshaws were the most favoured mode of transport. I even had a rickshaw-wala to drop and pick me up from school (like the buses and vans of today). My favourite place in the rickshaw was at the back. It was bench like protrusion facing the opp side. 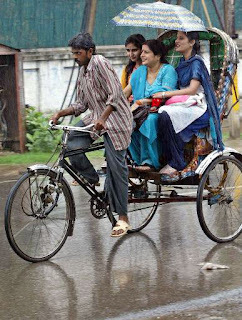 It’s a different story that now I pity the rickshaw drivers who toiled and pulled on the cycles to ease our movement. I guess that the love for movies has something to do with the chromosomes. My kids are testimony to the fact and my father’s favourite time pass is bolly-molly-woods! So, you should not have any doubts about me being a movie freak too. When India had not yet seen multiplexes and when movies meant big halls with creaking fans, we, as in, my parents, my bro and me, would make it a point to go for a weekend outing to those halls. It used to be a big occasion with even coffee being carried in thermos flasks and lot of farsans and some such to munch on (with popcorns being counted under luxuries). We have seen all the hits as well as flops of the 80s. A vacation to my grandparent’s village was something I looked forward to, each summer when Delhi and the other northern areas used to be scorching and frying everyone and everything. Whether it was the pond next door, or the clean and huge temples with its never ending alleys, whether it was a life without TVs, or the wells where we used to draw out the water using rope and pulley, whether there were fights amongst us cousins for the only table fan in the house or the get-togethers during festivals, the village life had its own charm. This will always remain one of my fondest memories of my childhood. The 36 hours of train travel when we went to Chennai from Delhi again was an occasion of sorts. The packing of clothes was something for my mother to decide but “how to spend time” during those 36 hours was something which required careful planning. Playing Cards were the most favoured option followed by books. Those were the times when Nancy was my heroine and I spent many a train journey with her solving all those cryptic mysteries. Then ofcourse, there always was the option of Antakshari. The train journeys were memorable since they also gave us the chance to mingle with unknown people who shared the journey and the destination with us and yet all led different lives. One of our favourite pastime was trying to ape our elders. Sometimes, mummy-daddy, sometimes teacher-teacher, sometimes doctor-patient, the names were different but the aim was one- acting :) Infact, begging mom for a saree and then draping it haphazardly gave some kind of immense pleasure. When my daughters did the same, I could imagine what a sight I had made way back then! I loved, I love dancing and I will always love dancing. Luckily my mother saw this passion of mine and got me enrolled in Indian classical dance classes. I used to love going for them. I took part in number of performances and had the chance to visit a lot of places along with my Guru. Though its a pity that the hobby got lost in the whole humdrum of living, and has mellowed down with age, the child in me still cant hold back herself during the seasons of Garbha and Dandiyas. Ah! I truly miss those days.